Get the Label started in 1999 with a simple idea: getting the very best deals on the very best brands. Now offering over 7,000 items with up to 75% off RRP, it has more than lived up to that promise in getting luxury, premium fashion available for a fraction of what you’d pay for it elsewhere. A quick glance at the brand list reveals this is a retailer that means business, with global superstar selections from Beyonce, Justin Bieber and Lady Gaga rubbing shoulders with established luxury lines from Marc Jacobs, Versace and Calvin Klein. This always evolving collection is never short of ways to impress, and you could get yourself discounted officewear to cut a dash at your desk, better value casualwear for when you’re off your best behaviour or a discount on something for a night out so you can look great without forking over your life savings. Get the shirts, shoes, dresses and trousers you need to satisfy that gaping hole in your wardrobe without leaving a gaping hole in your budget! How do I use my Get The Label promo code? Get the Label’s sale section is full of great deals on its stock! Can I get a student discount with Get The Label? You sure can, enter your details here and enjoy a 15% discount. Can I get a Get the Label catalogue? Yes, you can order them here. Does Get the Label have a size guide? Its size guide can be found here. 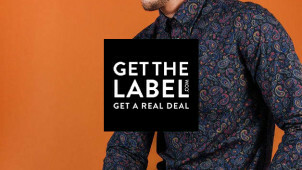 Can I get free delivery with Get the Label? Yes, if you spend over €60. Does Get the Label have a clearance section? Yes, you’ll find more amazing deals on its stock when you head here. You can return your purchase within 21 days of receipt to receive an exchange or refund. Item must be in original conditions and packaging with tags still attached. Earrings and underwear cannot be returned. Returns must be made by post and you must include and fill out the returns label that came with your order. Full policy here. If you’ve got a taste for designer fashion but are stuck with limited funds, you’d think you’d just have to settle for less, right? Wrong. Get the Label specialises in bringing you discounts on the hottest names in fashion and shopping with a Get the Label discount code from vouchercloud means you’ll be in for a double saving. With up to 75% off big brands including Timberland, Emporio Armani and Lacoste, this will fast become your fashion favourite. You can get further into the Get the Label lifestyle by checking out its blog. You’ll get tips on the latest additions to its range as well as news on what’s hot in the fashion and lifestyle scene. Full of handy tips and hacks on making the most of your wardrobe in all seasons, it’ll fast becoming a firm friend in the world of looking good on a budget. You’ll wonder how you ever managed without it! We all know staying in shape is important but we often resent stumping up cash for gym gear. Luckily, Get the Label has a dedicated activewear section that means you can get your leggings, shorts, trainers, sports bras and more without going over budget and using a Get the Label promo code from vouchercloud will get you an extra saving too. Now you can hit the gym in the right gear without paying through the nose, so get involved today!